I love football. As a teenager I sustained quite a few injuries playing football with the neighborhood guys. We had rules that the guys were two hand touch but girls could tackle. I was usually the only girl and loved throwing my tiny frame at the hulking guys to try and bring them to the ground. It felt powerful, exhilarating, and well, it was a good excuse for getting to touch cute boys! I still love football but I’m wiser, older and more breakable, so prefer to be the 12th man and watch from the sidelines (or the comfort of my living room). Of course, you can’t watch football without great food. 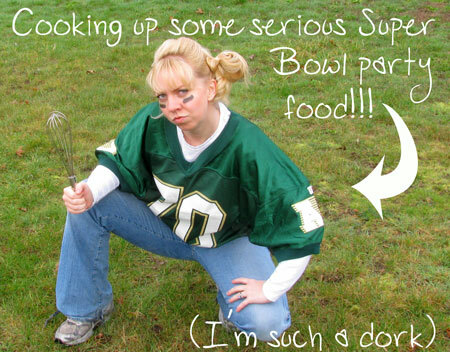 Here are a few of my personal favorite recipes for the Super Bowl along with links to other recipe round ups. Yes, you now have HUNDREDS of recipes at your fingertips!!! LOL ~ Diana, love your pic! CUTE! WOW- thanks for all the ideas and recipes!!! Have fun on Super Bowl Sunday! I recognize the Auburn Trojans jersey. My son wore one for 3 years!!! I can’t wait to try some of the recipes. I am going to have an appetizer party in a few weeks. Thought that would be fun for a change instead of a main entree!